The homeostasis of the blood system is maintained by rare populations of multipotent hematopoietic stem cells (HSCs). HSCs are by far the most widely utilized human stem cells in the clinic in order to treat blood-related disorders, such as leukemia. HSCs are maintained by interactions with cells comprising their microenvironmental niche, which is established in the bone marrow in mammals. Despite the similarity of blood cell subsets, HSCs in teleost fish reside in the urinary organ, kidney, representing a very different environment relative to mammals. We will utilize comparative approaches for the study of HSC niches between zebrafish and mammals. Our ultimate goal is to define the required core components that regulate HSC dormancy, proliferation, and differentiation. A major goal of regenerative medicine is to instruct tissue-specific stem cells from induced pluripotent stem cells (iPSCs). Despite decades of efforts, however, generation of HSCs from iPSCs in vitro is not currently possible, indicating that an improved understanding of the native mechanisms of embryonic HSC specification is required. 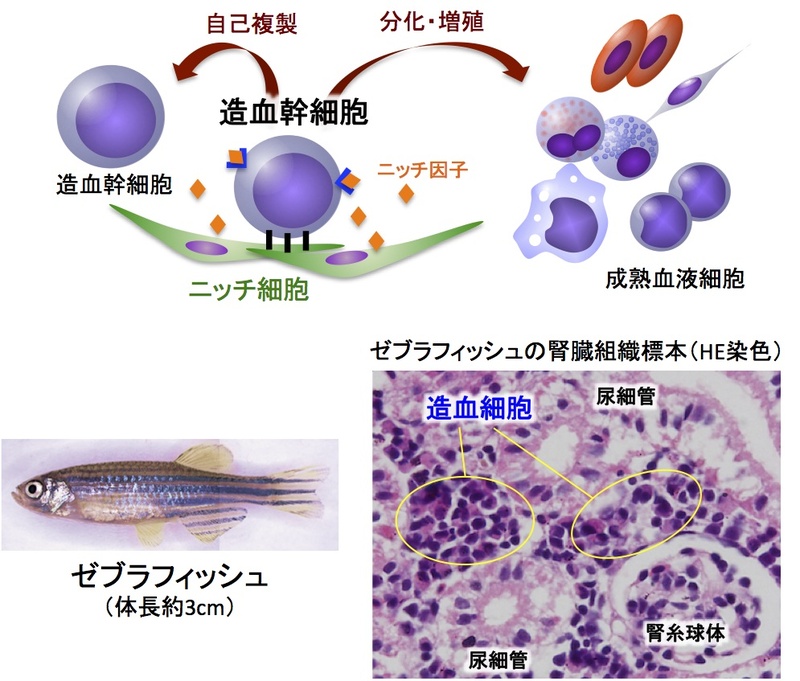 The zebrafish is a powerful genetic model for the study of HSCs. Its transparent embryos allow us to visualize the dynamics of developing HSCs using cell-specific transgenic animals. The movie shown here represents migration of angioblasts (green) along the ventral surface of somites (red). Utilizing “live-imaging” approaches in the zebrafish embryo, we will investigate when, where, and how HSC precursors are regulated by their environmental cells to establish HSC fate during embryogenesis.